Throughout my time in South Africa, we have learned a lot about the history of this country, including the struggles it has faced, the most prominent struggle being Apartheid, the system of racial discrimination and segregation. We had the chance to visit the Apartheid Museum, Mandela house, Robben Island, and District Six. At the Apartheid Museum, we began by receiving a ticket indicating whether we would be white or non-white. This served the purpose of replicating what separation and segregation was like during Apartheid. After the entrance, we regrouped with the people who we were separated from and walked down a pathway with sections of “we are” statements. These included “We are thinkers”, “We are fighters”, “We are storytellers” as a way to display that we are all human despite our race. This was a powerful entrance to the museum that prepared us to learn more about Apartheid and the consequences of it. The museum was quite large and a bit overwhelming with the amount of information it held. But, it was still a good overview of Apartheid and I learned a lot from it. Racial discrimination and segregation have been present in South Africa since colonists arrived, but Apartheid began in 1948 after the Great Depression and WWII. The ANP political party (made up of whites) won the election and implemented stricter segregation laws throughout the country. They did not only separate whites from non-whites, but divided blacks by their native tribes and coloureds. By the 1950s laws were put in place that separated families of mixed race and interracial marriages were outlawed. In addition, land was taken from non-whites to give to whites, forcing them out of their homes and into worse neighborhoods and housing. This is what happened to those who lived in the District Six neighborhood in Cape Town. We were able to visit this neighborhood and their museum to learn about the injustices their community had faced. There were stories shared throughout the museum highlighting the families that had lived in District Six for generations and were forced away from their family’s history. They were given very short notice and often couldn’t carry more than a suitcase, as you can see below. These forced removals occurred across the country in cities and in rural areas, as well. Because of the constant build up of injustices, like these, there were countless oppositions to the white supremacists and the government, including strikes, protests, and demonstrations against the actions of the government. Nelson Mandela was one of the most influential anti-Apartheid leaders during this time. A member of the African National Congress (ANC), Mandela lead this organization’s campaign by organizing protests and speaking out against the Apartheid laws. After 69 people were killed by police in a peaceful protest, Mandela formed a new wing of the ANC known as MK. With this new party, he planned a campaign against the government which involved him illegally leaving the country to attend a conference. Upon his return he was sentenced to prison for 5 years. During the first year of his sentence, evidence was found in the ANC hideout that further implicated Mandela, causing him to be sentenced to life imprisonment. 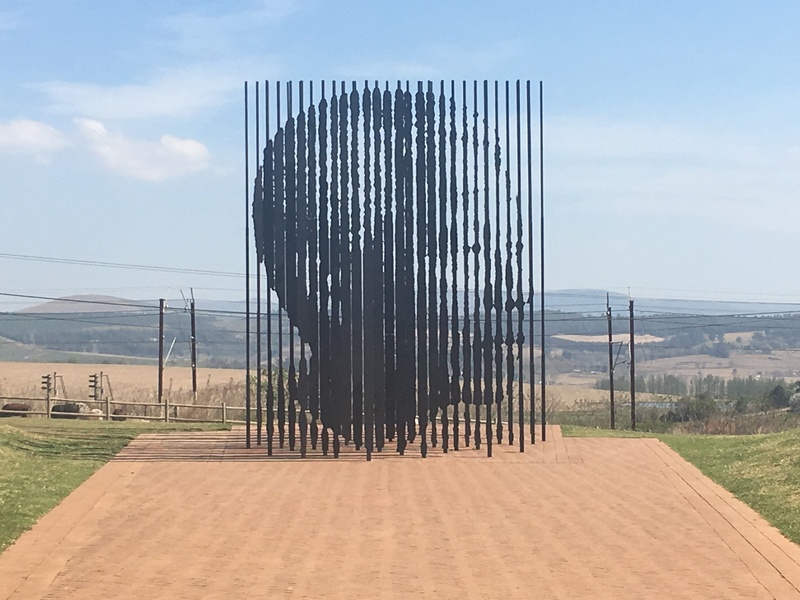 A memorial at the Nelson Mandela capture site, near Durban, where he was captured after returning from the conference. The first 18 years of his sentence were spent on Robben Island, which we got the chance to visit. This is an island off of the coast of Cape Town, similar to Alcatraz in California. Most of the political prisoners of this time were imprisoned on Robben Island with Mandela. We were able to see the living conditions the prisoners lived under and were even lead on a tour by a former political prisoner who was there at the same time as Mandela. The cells were tiny and there were no bathrooms, just buckets for the prisoners. Their only access to the outdoors was their cell block’s courtyard. Our tour guide told us that cell blocks would communicate with each other by hiding notes inside of tennis balls and “accidentally” hitting the tennis ball into the next courtyard. This continued until all of the cell blocks had received the message. We also got to see Mandela’s cell specifically, which is where he began writing his autobiography, “A Long Walk to Freedom”. In 1980, the “Free Nelson Mandela” campaign began, calling for the government to release Mandela. The government agreed to free him if he was willing to make political compromises, which he declined. After conditions, protests, and demonstrations worsened during the 1980s, South Africa received lots of international attention that negatively affected their economy. This led the party in power to step aside during the election in 1989, and de Klerk was voted into office, where he freed all political prisoners, including Nelson Mandela and worked to end Apartheid. Once Mandela was freed, he returned to his home in Soweto, which is now open to visit and known as the Mandela House. This small house only contains two small bedrooms, a living area with a gas stove, and a bathroom. Outside the house we were able to see bullet holes from shots taken at his house during Apartheid, and the house was filled with history, from awards Mandela had won, to hand written pages of his autobiography he wrote in prison. Seeing all of his life portrayed throughout his house and walking in the place that he lived was a unique experience and one I am thankful I was able to have. Nelson Mandela did so much for his country and everybody respected him for being a man with such kind character and passion for justice. Due to his anti-Apartheid leadership and this respect, Nelson Mandela became the first post-Apartheid president of South Africa in 1994 and served one term until 1999, greatly helping his country transition into the post-Apartheid era. Studying abroad in a country with such a recent history, only being out of Apartheid for just about 25 years, has been a very eye-opening experience. The legacy that Apartheid has left on this country is still very present. Inequality is still prevalent in many aspects of life (education, living conditions, healthcare, just to name a few) and the repercussions of it are very evident in the gap between the poor and the rich. I have learned a lot from how South Africa has been trying to mend the gap and bring equality to its people, despite the poor governmental leadership since Mandela. I hope I can continue to follow South Africa as they continue moving forward past Apartheid.